For centuries, the Long Beach Peninsula has been known for the treacherous waters off its western shore, prompting seafarers and fishermen to call it the “Graveyard of the Pacific.” But it’s not only the ghosts of shipwrecked mariners that residents whisper about on stormy winter nights. As Ghost Stories of the Long Beach Peninsula proves,the truly chilling tales are more often about earthbound spirits and specters that linger in the weathered communities along the Peninsula. Early settlers of the region, long-ago neighbors, and family members sometimes refuse to leave the area, even after death. Join author/historian Sydney Stevens as she explores unanswered questions about the ghostly phantoms that cling tenaciously to this isolated region. 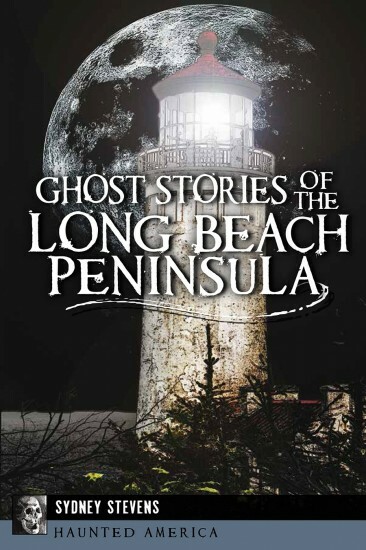 Ghost Stories of the Long Beach Peninsula retails for $19.99 and is available or can be special ordered at local independent bookstores, at History Press http://historypress.net/ or through Amazon.com by clicking on the appropriate book cover icon below left.